"In addressing the following History of a worthy family to young readers, it may be thought, by some, that I have presented pictures of too gloomy a nature, and scenes of too affection a kind for their season of life; but I am persuaded, that children themselves will...trace with me the various joys and sorrows of boys like themselves." Hofland's children's book tells the story of Maria Atkinson, her marriage to Captain Charles Belfield, the birth of their five children (Charles, Henry, Anna, Maria, and Edward), and Maria's widowhood after her husband’s death in Holland. While Maria, the daughter of a clergyman, had received “the best education, in every respect, a female can receive,” she is unable to financially support herself and her children (1). Despite Hofland’s preface, the first third of her novel focuses on Maria’s childhood, courtship and marriage to Charles, subject matter that would presumably be much more interesting to coming-of-age female readers than male ones. When Charles returns injured, it was then that “poor Maria began to feel those miseries which a soldier’s wife is heir to” (27). Thus Maria’s inheritance is the burden of single motherhood and widowhood: “To attempt describing the grief, the bitter grief of Maria, is altogether impossible” (29). At the moment Charles dies and Maria becomes a widow, the narrator addresses the reader: “…some of my young readers are themselves the children of widows, they may have seen their mammas weep when no one was by, and have seen them smile through their tears at their innocent means of relieving sorrows, of which their little hearts knew not the cause. They may perhaps form a faint idea of Maria’s sufferings, but I hope many of my young friends enjoy a happy ignorance of such misery as was felt by all this amiable family” (30). The reality was that many of Hofland’s readers, male and female, adult and child alike, would have known similar heartache. In fact, those who suffered the greatest degree of “sorrows” and “sufferings” during the early nineteenth century were the children, sent out to labor in factories, in mines, and as chimney sweeps in order to lessen the burden their lives placed on their families. Just as Charles’ death ends one chapter, Maria’s financial desperation as the single mother of five begins the next: “As soon as poor Mrs. Belfield became capable of attending to the advice of her father, she began to consult with him on the means of providing for her family” (31). Maria is described as “using every means which a wise and good woman could suggest, for calming her own mind, and fulfilling the awful duties of her widowed situation” (32). As her own father is unable to offer much financial support because he has to consider the possibility of his own wife’s future widowhood, Maria relocates herself and her children to a poor cottage in Lincolnshire, the cheapest conditions she can afford, leaving her oldest son, Charles, behind to live with his grandparents. While Maria struggles to provide, her two oldest sons, Charles and Henry, are likewise subject to guilt and called upon to provide: “Poor Charles, too, suffered little less than they did: possessing thoughtfulness beyond his years, he saw himself not only deprived of a tender parent…but all his hopes in life blasted, and himself thrown a burden upon a mother, already overloaded….He felt his own insufficiency to gain a livelihood by any of the ordinary means of exertion, and, with inward anguish, exclaimed, ‘I cannot dig, and to beg I am ashamed’” (44). The types of “ordinary means of exertion” that Charles refers to are those common to children of the Industrial Revolution. Charles anguish at having to pursue one of these options is too much for him, and possibly for Hofland as well. Charles and Henry both escape the factories, mines, and other cruel options made for children of the lower classes. Instead, Charles unhappily pursues a career as a soldier questioning, “‘Oh!’ said Charles, bursting into an agony of tears, ‘must I never, never enjoy this happiness’” (53). For Henry, his immediate future consists of a life working in trade, something that he equally despises—“in trade! no, that I will never consent to; I despise it, I hate it, and I never will be forced into it” (56). But Henry is likewise forced into a field of labor that he hates, if by nothing more than the guilt of his position as the child of a widow as he “began to feel that he was, indeed, a burthen to his mother…. I am big enough, and old enough, and then my mother will be rid of me. –If I cannot obey her wishes, I can save her from supporting an undutiful child” (71). Ultimately both Charles and Henry are rewarded for their sacrifices and manage to avoid the horrors of child labor during the Industrial Revolution. Furthermore, each is rewarded financially. Henry becomes a hero, saving a woman from a fire and then his employer from murder during an armed robbery. While Charles’ triumphs are not as glamorous, he is also financially rewarded for his services in the English military. Within her first children's book, Hofland showed her perspective on the working condition of England and the class structures of labor. 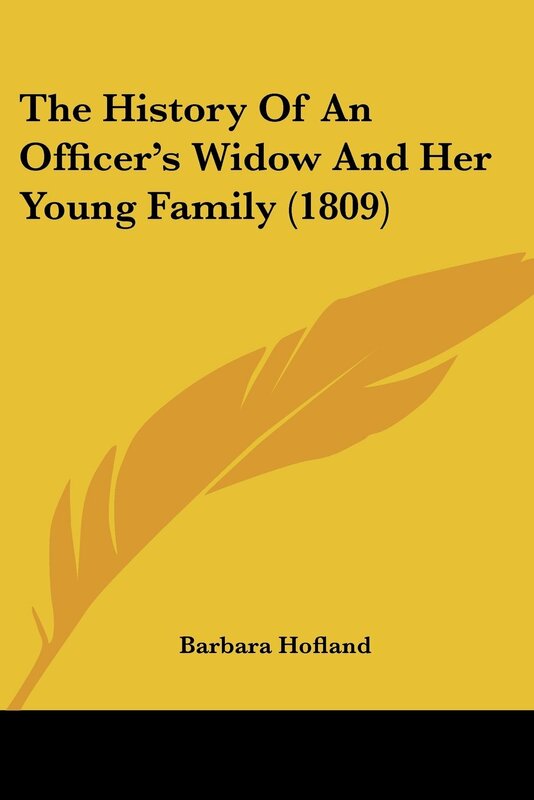 As a widow, Hofland turned to writing in order to support herself and her family. While authorship was still a male-dominated occupation, Hofland maintained her right to participate in the field. Yet while her main female protagonist, Maria Belfield, is also a widow, Hofland does not portray her protagonist as fulfilling any specific vocation. Moreover, it is Maria's two sons that take center stage and become responsible for the financial future of the family while Maria and her two daughters remain minor characters at home. Despite their destitution, all of the characters within The History of an Officer’s Widow manage to escape the danger, dirt, and despair of the laboring classes within the Industrial Revolution, and by so doing their reward is secured through financial gains that enable them to stay within the middle-class rankings. Hofland’s novel ends confirming this moral: “and all the parties are in a state of as much health and happiness as can be expected in this world, having the promise of the good things of this life, and of that which is to come” (182). For further analysis on Hofland, see Stephen C. Behrendt's British Women Poets and the Romantic Writing Community (Baltimore: Johns Hopkins UP, 2008) and Dennis Butts' Children's Literature and Social Change: Some Case Studies from Barbara Hofland to Philip Pullman (Cambridge: Lutterworth Press, 2010).